A lot of metamorphism must have gone on in West Rutland at the dawn of time. According to that unimpeachable source, Wikipedia, marble “is a metamorphic rock resulting from the metamorphism of limestone, composed mostly of calcite (a crystalline form of calcium carbonate, CaCO3).” In the 1800s, Redfield Proctor’s Vermont Marble Company thrived in West Rutland; today, his disused quarry yard off Marble Street still thrives — as the home of the Carving Studio and Sculpture Center. Approximately 200 sculptures of every size and form now dot the post-industrial landscape. Thirteen of those outdoor sculptures compose SculptFest07. This year’s SculptFest includes site-specific works by artists from three continents, as well as pieces that utilize two of the old quarry pits, now filled with water. California artist Shannon Wright’s “Feral Fence” is a 10-foot-tall chain-link fence made of pristine, gleaming steel, running 40 feet along the rim of one of the old quarries. A jumble of Y-shaped barbed-wire fence-post caps are woven with three strands of prickly wire, as if to suggest the old quarry is a treasure not be trespassed on. Of course, it’s an absurd fence, and possibly a wry critique of some of the border schemes currently being discussed in Washington, D.C.
Massachusetts sculptor Jessica Leete built another quarry piece, entitled “Sculptural Continuum.” Twenty-three floating discs, ranging from about 10 to 30 inches, were cast and heaped with marble dust. A line of white dust was also spread around the quarry pond’s edges. At one end of the pond, a 5-foot-long marble plumb bob hangs from a dilapidated crane. It’s as if ghosts still work there, ferreting out whatever stone is left. Red maple leaves float among the white disks. “Working with Memories” by Nora Valdez, also from Massachusetts, features a completely different sort of space but equally haunting forms. 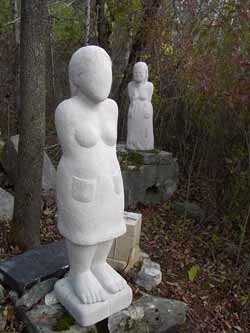 The intimate piece nestled under trees includes three female figures carved from that locally ubiquitous material, marble. Valdes sited her piece along the Carving Center’s main back pathway. Each figure is about 5 feet tall and stands among rough-textured rocks and lichens. The figures wear dresses and are chunky, yet oddly graceful. Two other pieces in the show are primarily about color. Manhattan artist Elisabeth Marsh enlisted a bright-yellow garden hose to create what may be the largest piece in the show. Large and insidious, that is. Pieces of hose slither all the way up the show’s back pathway. Sometimes it appears in sections of several feet, with both ends buried. Elsewhere, smaller lengths pop up like worms on a sidewalk. In a large, uprooted tree-root ball, fanned open to resemble Medusa’s hair, thumb-sized pieces top the tips of the roots. It’s a visual background element that highlights the gestalt of the entire area, around and between more self-contained pieces. Ohio sculptor Ashley Warren’s “Sense of Wonder” plays with the colors of the site, which will inevitably change as autumn approaches. Warren wrapped the trunks of seven white birch trees in ribbons of material in several shades of red, extending from the ground to heights varying from about 4 to 7 feet. Because the reds are so close in hue, they become almost iridescent in sunlight. On a cloudy day they will look somewhat different. When the birch leaves turn yellow and other splendid fall colors appear in West Rutland, the red-wrapped birches will take on yet another demeanor. This year’s SculptFest curator was the distinguished Castleton State College drawing professor Bill Ramage, and the show’s theme is “Nature and Transcendence.” It’s a great theme for an exhibition of site-specific works: The nature part is everywhere; the transcendence idea remains elegantly imprecise. SculptFest07: The annual outdoor exhibit features site-specific installations by 13 artists. Carving Studio and Sculpture Center, West Rutland. Through October 28.